Ithaca carries the torch for Mid-Michigan football. Then there’s DeWitt, a great program with coach Rob Zimmerman that has missed the playoffs just once in the new century. Junior QB Jake Johnson has talent at his disposal, and the D has been strong enough to win the close ones like 21-20 in the semifinal with St. Clair. The Panthers have yet to see an offense as relentless as Zeeland West’s. The Dux average nearly 50 points and 400 rushing yards per game. DeWitt may be capable of keeping up, they’ve played and won five similarly paced games. Menominee is looking for its first championship since coach Joe Noha was an assistant for Ken Hofer in 2007. West Catholic has been, if not a stronger program ,then at least a more fortunate postseason participant than the UP team. Menominee has a balanced offense which has rolled through the playoffs, including 59-28 against Muskegon Oakridge in the semifinal and 49-27 on Standish-Sterling the week before. West Catholic is a 5-4 bonus baby living the dream. This is a very veteran group that lost on Ford Field just last year. Not this time. He showed his bonafides in the Division 8 state final, where he led MCC with nine tackles and two passes broken up, while running for 218 yards and three TDs. That’s a microcosm of the season, as he was the Crusaders’ leading rusher and tackler all fall. Both fast and a hitter, Lewandoski was the best player on the field regardless of if the other team included Big Ten or MAC recruits. He led a defense that pitched four shutouts, while scoring TDs via the run, catch, interception return, kick return and punt return. After missing most of his junior season with an injury, Stanitzek made up for lost time as a senior. He was the one circled in every West Catholic opponent’s scouting report, and demanded double teams both as a defensive end and tight end. For his career, made 40 tackles behind the line of scrimmage. Stanitzek is verbally committed to Eastern Michigan. He made 65 tackles from his defensive end spot. 13 of those were sacks, which nearly doubled Elk Rapids’ previous school record. He went both ways, playing center on offense. Thompson and the Elks’ standout QB, Adam Trautman, were team captains as just juniors. What a whirlwind for Williams. From a veritable unknown, to committing to Toledo, then Missouri, and now finally just down the road to Notre Dame. He made 69 tackles, including 12.5 sacks. It wasn’t a storybook season for one of the Lake Area’s most accomplished programs. But Armour showed up and helped the Glads make the playoffs, again leading them in tackles despite playing with a broken arm. He had a 28-tackle game as a sophomore, and didn’t stop until setting the career record for this 50-year-old program. Boorsma heads into Saturday’s Division 5 state championship game. Through district play, Boorsma had 140 tackles and forced three fumbles. The second-leading tackler for the Division 8 state champions, after All-Lake Defensive MVP Alex Lewandoski, including a dozen behind the line. Jordan also picked off three passes. Jordan will lead a large returning contingent last year, so a repeat trip to Ford Field isn’t a crazy thought for the Crusaders. Tough two-way player for Brandywine. He led the defense with 70 tackles, while on the other side Ward ran 141 times for 1,068 yards and 14 TDs. He was also Glen Lake’s leading tackler, in on 123 stops including 8.5 behind the line. Apsey did it on both sides of the ball, and was one of the most dangerous players in the North, with a 99-yard TD run to his credit. Apsey finished the season with 134 carries for 1,388 yards and 18 TDs. A one-man gang in Buchanan. As good as he is at running back, Freeman said he prefers defense and made five interceptions to prove his point. Offensively, he ran for 1,291 yards (and over 4,000 for his career) and 15 TDs. The top corner in the Lake Michigan Conference, checking the opponent’s top receiver in man coverage or playing the strong side. Noble had six interceptions, broke up nine tackles and recovered a fumble while makign 53 tackles. Noble was also Kalkaska’s quarterback, punter and kicker. Muskegon is the state’s all-time winningest program. Brother Rice’s Al Fracassa is the all-time winningest coach. This, a rematch of last year’s wild D2 final won by Brother Rice, will be Fracassa’s last game on the sidelines. This version of the Warriors is stronger than 2012. But they’ll have to see Muskegon QB Deshaun Thrower the entire game this time. After platooning QBs in the 2012 final, Brother Rice is more than content with just one this time around. Alex Malzone may be the state’s top junior QB, and he has a number of D1 recruits at the skill positions to toss it to. Defending state champion South Christian has looked even stronger than a year ago. Its defensive front was dominant at times against Comstock Park in the semis. The challenge against Marine City will be to slow down two 1,000-yard rushers, who run behind 6-3, 300 junior Kenton Rivard. Marine City has seen some tough QBs in the playoffs, but their toughest test will come in the form of Sailors junior Jon Wassink. Last year’s runner-up, most of Beal City’s key players are veterans of that experience, back to atone fo rthat 35-10 loss to Harbor Beach. Muskegon Catholic has faced the tougher path — its last two wins were over New Lothrop and Mendon. Hope College head coach Dean Kreps speaks to prospects at last year’s Senior Exposure Camp. Every MIAA and Michigan GLIAC school were represented at that event. This year’s is Sunday, Dec. 8 in Grand Rapids. Register by clicking “2013 Senior Exposure Camp” at the top of the page. With Marion behind center, Lake City experienced unprecedented success. Their past two seasons have given the Trojans their most wins and most points in school history. As a senior, Marion completed 60 percent of his passes for 1,843 yards and 16 TDs while running for 1,529 yards and 33 TDs. He battled through injuries the past two seasons, but when Swore was healthy, he was as tough a QB as you’ll find in the Lake Area. He led NorthPointe Christian to unprecedented success, losing only one game which he both started and finished, last year to Lake City and 2013 Offensive MVP Drew Marion. As a senior, Swore completed 40-of-60 passes for 532 yards and 11 TDS, while running for seven TDs. Caughey anchored a line that helped produce the most prolific offense in Muskegon Catholic Central history, which has been good enough to take them to the Division 8 state final. As the Crusaders’ right tackle, Caughey was the tip of the spear in their rushing attack. Also played on the defensive line. Corey has started 40 consecutive games at center for West Catholic, headed into the Division 5 state championship against Menominee. It’s West Catholic’s second-straight state final appearance. During that time, Corey’s graded out as a 90-percent blocker. When Lake Michigan Catholic was running the ball, everyone in the stadium knew it was behind this big junior. He played both the left and right side of the line, at tackle and guard. Murphy could end up on either side of the line in college. Michigan State struck gold with a recent lightly recruited lineman from the Lake Area, Plainwell’s Jack Conklin who is starting at left tackle for the Spartans as a red-shirt freshman. They’re hoping to have cashed in again on Padla. He’s a blue-collar pulling guard but with the light feet to possibly play tackle. He went both ways for Berrien Springs, making 47 tackles, six of them behind the line, and returned an interception for a TD. He was a two-time first-team all-league selection in the Central State, and the top vote-getter on the offensive line in 2013. Sweet was a stalwart on a line which cleared the way for the Coyotes to compile nearly 4,500 yards total offense during the regular season. He was the total package as a receiver, with not just speed but hands and a knack for adjusting and getting the ball. No receiver in the Lake Area put up better numbers than McClanahan, ranking first across the board with 80 catches for 1,223 yards and 18 TDs. Mojsiejenko did it all for Bridgman, as the featured member of its offense but also an outside linebacker, kick returner, place kicker and a punter averaging 49 yards per attempt. But it was as a receiver that Mojsiejenko did the most damage, with the speed to stretch the field and toughness to produce over the middle. He had 47 catches for 1,120 yards and seven TDs. Kalkaska returned only one member of its offensive line, but that didn’t stop Hauser from rushing 178 times for 1,342 yards and 16 TDs to go with nine catches for 167 yards and three TDs. He did that in eight games, while also excelling defensively where he had 30 tackles, an interception, a forced fumble and a fumble recovery. He turned in a second-straight 1,300-yard rushing season, with 1,378 and 13 TDs in eight games. He also returned a kick for a TD. As Walker succeeded, so did Harbor, with three then four wins the past two seasons after putting up a goose egg in 2011. It is Walker’s athleticism and versatility that earned him multiple D1 offers as a defensive end, tight end or h-back, before choosing to play next season at Harvard. Muskegon is making its second straight appearance in the Division 2 state final, with a defense built on the capable shoulders of Finley. What really separates Finley, besides the size, the strength and speed, is his motor. He demands so much attention and creates so much havoc on the right side of the line, it opens things up for teammates to make plays. Not that Finley isn’t making them himself. In the regular season he had 17 tackles for loss, including seven sacks. As is the Big School Offensive MVP, Zeeland West’s Jordan VanDort, Finley is verbally committed to Western Michigan. From pass rush specialist to every down impact player, Gruszka was a key member of the first undefeated regular season team in Comstock Park history. He had 70 tackles in the regular season, including seven sacks. Gruszka was also a standout tight end. Cornerstone of the Lake Area’s stingiest defense. In the regular season Howe had 84 tackles, including 11 sacks. He also rushed for four TDS and was the Huskies’ kicked and punter. From a talented overall roster, Tottingham was called by Reeths-Puffer coach Kyle Jewett the Rockets’ best player. He’s a two-way lineman, a center and defensive tackle, who was a tough cover because he could both bull rush his man, or make him miss. In the regular season Tottingham had three sacks, forced three fumbles and recovered three fumbles. Projects as a college safety, but was a terrific high school linebacker for a lock-down defense. Played so fast and hard, hit like a much bigger man. Also made an impact with his relentless special teams coverage. Batdorff led Forest Hills Northern with 104 tackles. Classic middle linebacker who has done it on the big stage for years, leading Rockford in tackles the past three seasons. With that veteran savvy, Showers had a knack for ending up in the right spots, and when he did there was as good chance a big hit was ensuing. As a senior he led Rockford with 120 tackles, including 23 behind the line of scrimmage. Wayland was one of the Lake Area’s happiest stories, going from a win-less 2012 to making the playoffs. When you have players like Sweeney, can’t be held down forever. He was Wayland’s leading tacker and also started at tight end on one of the Lake Area’s most prolific rushing offenses. Had a career notable for LaRoche’s knack for stepping up to make big plays, and Comstock Park certainly provided him with the opportunities to play in games that mattered. He made 50 tackles with four interceptions and three passes broken up. He filled in admirably at quarterback in the playoffs and was the Mustangs’ kicker, but where Losey really made his impact was on defense. It didn’t matter where he was on the field either, whether making 11 interceptions, or three sacks. He put up silly stats as Lowell’s quarterback. But unlike a lot of QBs who may see spot minutes in the defensive backfield when a team needs their best athletes out there, Shurlow was an every down corner for the Red Arrows, and a good one. Oh, about that offense — Shurlow threw for 1,944 yards and 28 TDs, and ran for 889 yards and 18 TDs. A soft spot last year, Muskegon’s secondary was much improved in 2013 and gave the Big Reds stoppers at all three levels of the defense. Waire only allowed two passes completed against him during the regular season. This was the season VanDort’s physical potential translated into consistent dominance for Zeeland West. One half of their two tight end lineup, he cleaned up for the Lake Area’s most dangerous rushing game and highest scoring offense. He was also an impact player as a defensive tackle and on special teams. Though West rarely throws it, VanDort is the school’s all-time leading receiver because he’s not just a huge target, but has soft hands and surprisingly athleticism for a man his size. VanDort will be starting in his second state championship game Saturday against DeWitt. He has verbally committed to Western Michigan. He may be the only junior on this team, but Wassink has already led South Christian to two state finals. And this time, he’s healthy and will play. In a Lake Area 2015 class loaded with high-end QB talent, Wassink gets the nod because of his arm strength, he can nail those 20-yard outs, and how he can beat you with his legs as well. His athleticism was on display in the Division 4 semifinals, when he played in South Christian’s defensive backfield and made two interceptions against Comstock Park. Heading into Friday’s Division 4 championship game with Marine City, Wassink had completed 186-of-281 passes for 2,447 yards and 20 TDs while running 109 times for 657 yards and 14 TDs. He also caught an 18-yard TD pass. His potential at right tackle met improved toughness as a senior, and Hudsonville became one of the most physical punishing teams in the Lake Area, beating Rockford in the Division 1 playoffs. Akins was the anchor as Hudsonville suffered injuries on the line, and allowed junior QB Mason Opple to really blossom. Akins moves well at his size as a run blocker, gets downfield to bury linebackers. He will play his college ball for the Naval Academy. In a Grand Rapids Christian season cursed by injuries following their dream 2012, Doles was a constant and led as a new offensive line found its way. He’s an athletic left tackle who can both run and pass block. Doles also started on the Eagles’ defensive line. He is verbally committed to Northwestern. From project to player. He’s improved so much, with the potential for a lot more as he’s what college coaches are looking for in an offensive tackle — rangy and athletic. Jordan is verbally committed to Western Michigan. He was the only returning starter from Muskegon’s 2012 Division 2 state runner-up team. King moved from guard to left tackle and held it down as his young unit got its sea legs. Now? Muskegon is right back to Ford Field for a rematch with Brother Rice. While he projects as a guard for Ball State, King’s improved both his fitness level and in technique so that he was a dominant high school tackle. Mainstay of an offensive juggernaut that scored fewer than 40 points just twice heading into the Division 3 state final. A second-year starter at center, Tinholt was a rock of consistency for West’s sophomore QB Casey Brinks. It didn’t seem to matter who the Dux lined up at fullback, they were going to pile up yardage with Tinholt helping to spring them free. We saw glimpses of Bauder’s potential in last season’s playoff loss to Grand Rapids Christian. His big plays became a regularity as a senior, taking advantage of his 4.4 speed behind a dominant offensive line. Heading into the Division 3 state final, Bauder had run 135 times for 1,652 yards and 27 TDs. He also caught 7 TDs. He was both Comstock Park’s leading rusher and receiver as them went undefeated through the Division 4 semifinals. Bush ran 210 times for 1,418 yards and 24 TDs, with 35 catches for 457 yards and 4 TDs. One of three Western Michigan commitments on the All-Lake Offense alone, Brown teamed up with junior QB Tyree Jackson to form the Lake Area’s most dangerous toss-catch combo and help Mona Shores to the best season in school history. Brown had 56 receptions for 1,094 yards and 22 TDs. He also ran for four TDs, and was a standout at safety. With his big-time basketball vertical, no one in the Lake Area was better at high-pointing balls, making Steigenga the ultimate red zone threat. He’ll leave Holland Christian with every school receiving record. As a senior Steigenga had 57 catches for 961 yards and 17 TDs. Juniors not on the 2015 Team may have been selected for other All-Lake Teams. 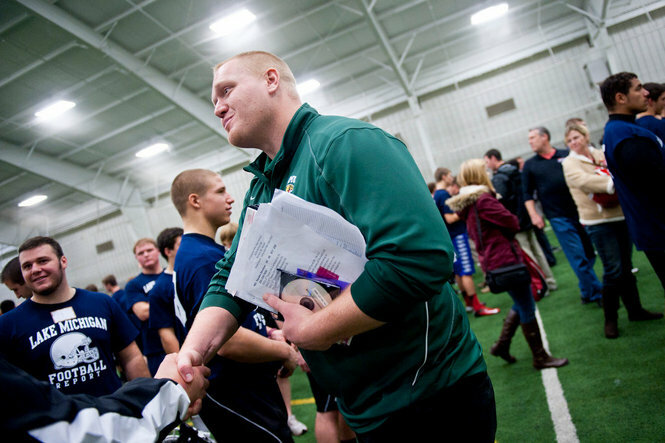 Northern Michigan University line coach Rob Boss speaks to prospects at last year’s Senior Exposure Camp. Every Michigan GLIAC school was represented at that event. This year’s is Sunday, Dec. 8 in Grand Rapids. Register by clicking “2013 Senior Exposure Camp” at the top of the page.